She actually dog-ears her books as she reads them! I'm suddenly finding it hard to breathe. Ok. It's ok. *pictures smooth, crisp, unfolded page corners, hundreds and hundreds of smooth, crisp, unfolded....* yeah, I'm fine. Phew! So, needless to say, Lindsey's preferred way to mangle, I MEAN read, her books suddenly had me mentally ticking off pet peeves when it comes to how people abuse, I MEAN handle, their book as they read them. 5. Cover Stains - Books should never be used as a drink coaster. I know this, I am sure YOU know this, but man, how many times do you witness someone placing a cold, sweating can of coke or a hot, dripping mug of coffee on top of their current read, amirite?! You know who you are, you book abuser! That poor cover will forever bear the wrinkly water marks and brown coffee ring stains of your bad decisions. Or how bout using your book as a buffer between your hand and the kitchen table when you are painting your nails? Oh gosh how that stuff makes me cringe! 3. Dog Ear - Believe it or not, this is a middle-of-the-road peeve of mine. More anxiety-inducing than the snacking and drinking. those poor folded page corners just look so painful to me. Sure, you can straighten them out and get the pages to lay somewhat flat again but the telltale triangular crease will never go away. And those once-perfect pages now have a weak spot, one that might entice its reader to unconsciously finger, or fold back and forth, until that abused little corner just gives up and detaches itself. Gasp! 2. Marginalia - Marking up the interior of books sets my teeth grinding and my skin crawling. Pencil, pen, colored marker... I don't care what writing tool you use, I can't STAND when people write in their books. A good plenty of the 700+ unread books I own came from library and book sales. It amazes me just how many people out there make notes, underline, and highlight in their books. More times than I can count, I've had to make the tough choice to put a book I've been DYING to read back on the shelf and walk away because of how severe and distracting the marginalia was, I want to read the author's words, not your thoughts on their words. God, use sticky notes or index cards for the love of all things literary. Or, better yet, since you "loved" the book enough to mark it up to hell, why not just keep it forever? Why give it up at all? 1. Cracked Spines - Oh how this makes my heart break. Those poor, prematurely aged books with the cracked and broken spines. Those evil, awful book abusers who actually ENJOY breaking a book in by grabbing a handful of pages from either side and CRAAAAACCCCKing that baby right down the middle. You know you who you are! Or how about those sadistic readers who fold their paperbacks over as they read them, so that the front and back covers are always touching? Which creates a million little hairline cracks down the spine... Ack! I've adopted my shared of cracked-spined books from used book stores and book sales. As I read them, I handle them with extra care, and love, and can't help but shed a tear for them as I turn the page and it partially separated from the inside of the spine because the damage was so intense. There should be a jail for readers who abuse their books so badly! So what about you? 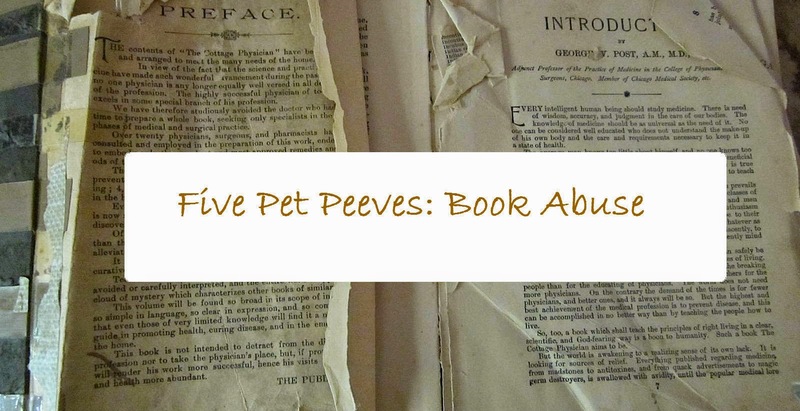 What are your biggest pet peeves when it comes to "book abuse"?? These are awesome ways in how NOT to treat a book! Although, I always think the exception to this rule are college books. Depending on the class, I would highlight, write on them, tag them, and wait for it....dog ear! I agree, the only time I can forgive writing in a book is a college textbook, or textbooks of any kind. Since they are actually meant for learning and studying... that makes sense to me. To be fair: I'm studying Communications, and much of that involves literature classes. They're not textbooks, but I'm still analyzing the heck out of them. That means I mark them up. I also put marginalia in books I own, even if they're not for school. That only happens, though, in books I'll never get rid of (which is most of my collection anyhow, lol). As far as my pet peeves go, the worst for me is people who bookmark by putting an open book down on the pages. With the spine up, and the book open, the spine cracks slowly and deliberately. I can almost hear the book screaming.